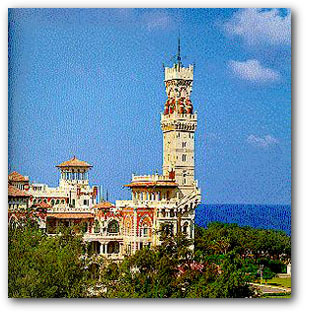 This 115 acre complex is surrounded by great walls from the south, east and west, and with the beach on its north side. This area used to belong to the Mohamed Ali family, that ruled Egypt from the mid 19th century until 1952. The construction was started in 1892 by King Abbas II, who built a large palace inside the complex called the Salamlek. In 1932, King Fuad built a larger palace and called it the Haramlik. His son, King Farouk, built a bridge to the sea to act as a water front. The rest of the 115 acres is nothing but beautiful gardens. Palm trees and gazelles cover the area. This is a wonderful spot to enjoy the beauty of Alexandria.